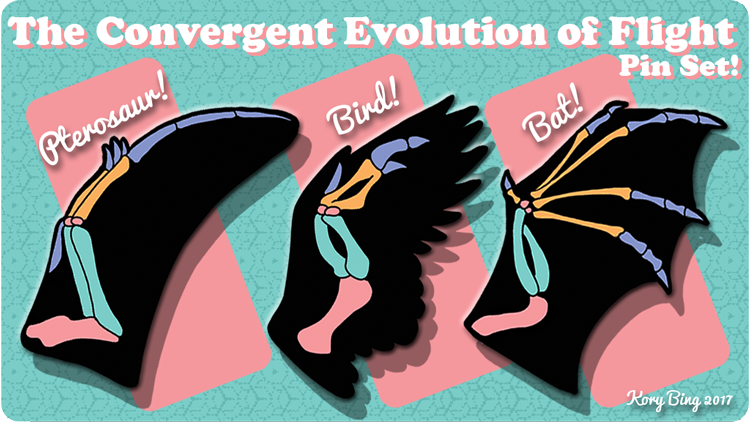 There’s about a week left on the Convergent Evolution of Flight Pin Set! 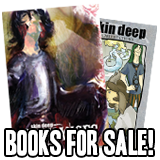 I will also be at GENCON in Indianapolis the week after next!! Oh, no, no, no… As a person who constantly struggles with “what if no one likes me or cares about me or wants to interact with me” itis, I have to put my foot down and…I’d give you some [hypocritical] advice, but I’m all out. Sorry. Hugs? Damn. I really hope he and Michelle end up alright. No Greg, you knew her as the person she used to be, you’re going to be more precious than ever. You’re going to be one of the few people she doesn’t have to explain herself to, one of the few people who’s not going to be expecting things of her. She’s been cast adrift in a sea of magic and is going to need you to hold on to more than ever. Also, you are overlooking one basic goat power. Goats are very hug-able animals, and great at sheering you up when you;re having a bad day. That said, I completely understand the “My friend is changing, how do I deal with my feelings, while still supporting them” issue, well written. Nooo!! Greg, she needs you as a shoulder to lean on, as someone who’ll be there to support her when she needs to just feel normal for a bit. You’re her friend!! Just keep being her friend and one day, one day you might become more. Her whole worlds about to start changing (assuming) and you’ll be one of the few constants in that new life! I know it’s hard to overcome these doubts but everything will work out. Am I the only one that’s seeing some familiar parallels between Greg here and Michelle back when she has to confront with her mother? Yeah you’re right. I get the feeling that her friends will get involved in the meeting since the council is having a very hard time believing what Michelle is saying. At least that’s how I’m hoping it will go just to prove to Greg that she’ll always need all of them to support her. I agree, Greg. Michelle at the very least deserves someone who can properly wear gloves. But I don’t think you should leave or anything like that. Your goat-boy powers do have a use to her. Where else is she going to get a portable coat rack? …Greg, hun, I don’t think she *likes* it. I mean, if for no other reason, then ‘cuz she’s had at least two attempts on her life by ancient and powerful magical factions. I’m not sure Michelle is the person he should vent to at the moment, though. Girl’s got too much on her table as it is ATM. Probably won’t do either kid much good. Don’t underestimate your own goaty powers, Greg. You fended off the Momo with naught but your forehead, didn’t cha? That, and he can probably eat cans, too! First, Merial, there’s hardly been any time since her…”godhood” and this meeting for them to have had any time to talk about this. Second, Greg, you’re being too hard on yourself. As everyone’s already said, she’s going to need you now more than ever. Third, instead of complaining about your uselessness, do something about it! Be it study magic, support her, something other than whine. Wallowing in insecurities and despair is no way to live, man. I agree that wallowing in insecurities is definitely not a great way to live, but for people who struggle with powerful anxiety and depression (myself included) it’s horribly easy to lose track of reality, becoming locked up in a constant inward-facing battle with all of the voices that tell you how much of a worthless person you are, struggling every day to acknowledge the possibility that you’re an okay person and that there are people who love and care about you. It happens to me constantly, and it’s one of the primary reasons why I struggle so much with a lot of the hobbies I love. It’s also why it’s so important to have strong support groups (which, as an introvert who works 40 hours a week I REALLY struggle with). He’s not “whining”. He’s trying to express himself inside an internal place of deteriorating self-esteem. The fact he’s even able to tell them about this I think speaks volumes about how much he trusts his friends. Be patient with Greg. He’s in a space of anxiety. He’s too filled with doubt. The only thing that will really help him is for him and Michelle to talk about everything that’s happened and their feelings about it. Greg, have you thought that you and your friends are the only ones who will still look at the sphinx and see Michelle, not the most magically powerfully being in the world? She needs you to keep her sane and safe. And she loves you. So stop looking at the sphinx and look at Michelle. Greg, you stop that this instant or you truly won’t deserve to be with her. She’s not a god, regardless of what weird ancestral powers she received. Don’t you ever try treating her like a goddess, because that’s not what she needs, or wants. Dont underestimate the power of a well placed headbutt. Greg, don’t underestimate the powers of goats. They are capable of eating anything, and are descendants of Shub-Niggurath. And has he SEEN what players are capable of in Goat Simulator? How much bug could a bugbear hug if a bugbear could hug bugs? A bugbear could hug all the bugs a bugbear’d care to hug. (wave empty honey bucket) I surrender. You mean something like “Gregchelle”? 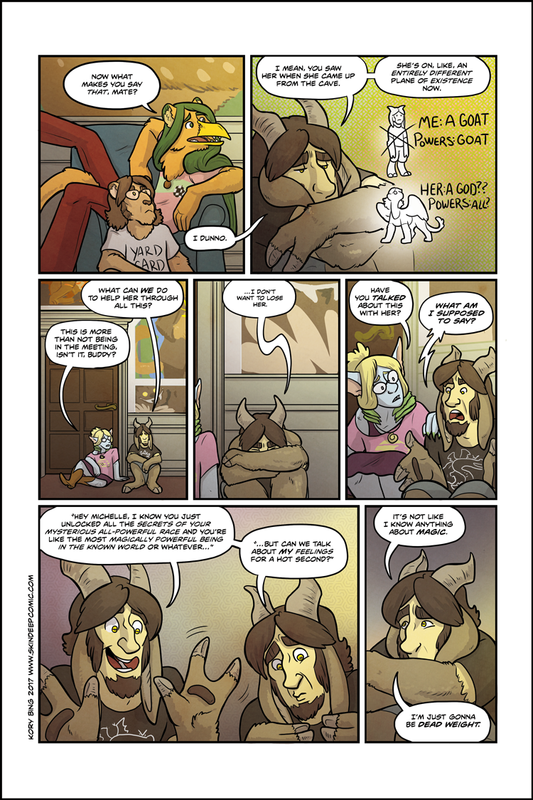 GREG: Talk to the horns, buddy. I think the “what if she does not need us” question is inherently troubling. No, she does not need you, she should not need you, you should be happy she does not need you. And then, if she chooses to hang around you, it is because she appreciates you for you, instead of needing you for something. But then i’m an introverted antisocial jerk, so what do i know. Oh frell Greg just go up to Michelle and talk to. I mean seriously dude how long have you known her now? About three years. Here is a little advice don’t worry about the consequences, get off of your furry arse and talk to her. This is maybe what she would say. ” Greg I would love to talk to you anytime. You helped me when I was feeling like my world was being destroyed then you reached out your hand and I saw hope. Please tell me what I can do to help you feel better.” Now Greg are you going to go in there and talk to Michelle or do I need to drag you by the ear it’s your choice. He’s only known her for nine or ten months, from August 2004 to June 2005. Other than that, you’re spot-on. And it’s great to see another Farscape fan! Dude!!! Hail to Farscape. And sorry for calling you a dude if you are a fem. Greg, your a great guy. And if Michelle don’t want you, I take you. 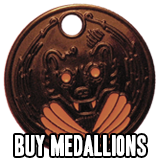 Pleas please please tell me they have good, real therapists and mental illness medication in MagicalFurry world. Greg really needs both. He has some seriously in-need-of-care issues. He’s been in a lot of misery since the beginning of the comic. Far too much self loathing to be healthy or happy.